This is a 5-night, 6-day workshop. Your adventure begins at 10 a.m. on July 14 and ends after a final slideshow on the afternoon of July 19. This workshop was rescheduled from late summer 2018 due to the wildfires in and around the park at that time. As with all National Parks at Night Passport Series workshops, we will teach at this location only once. 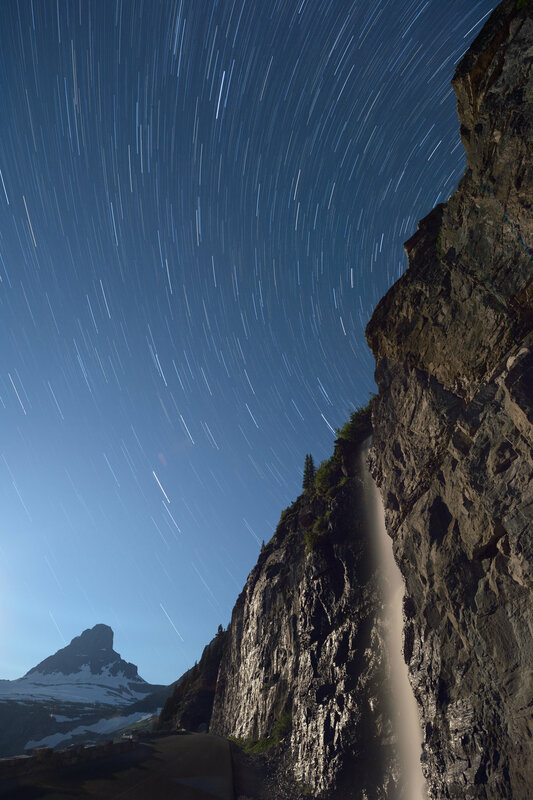 If you have a dream of making epic long exposures at night at Glacier National Park, we hope you join us. Balance of $1,250 due on April 15, 2019. Last day for a cancellation request is April 14 (see cancellation and refund policy). The first part of the week will find us on the east side of the Continental Divide. Commonly called the Eastern Front, this is where the High Plains meet the Rocky Mountains. Dramatic, remote and ruggedly beautiful, this section of the park provides some of the most breathtaking views in the lower 48. The second part of the week will be spent in the forested and lush western side. The colorful rocks and crystal-clear waters of McDonald Creek and Lake McDonald are the highlights on this side of the park. 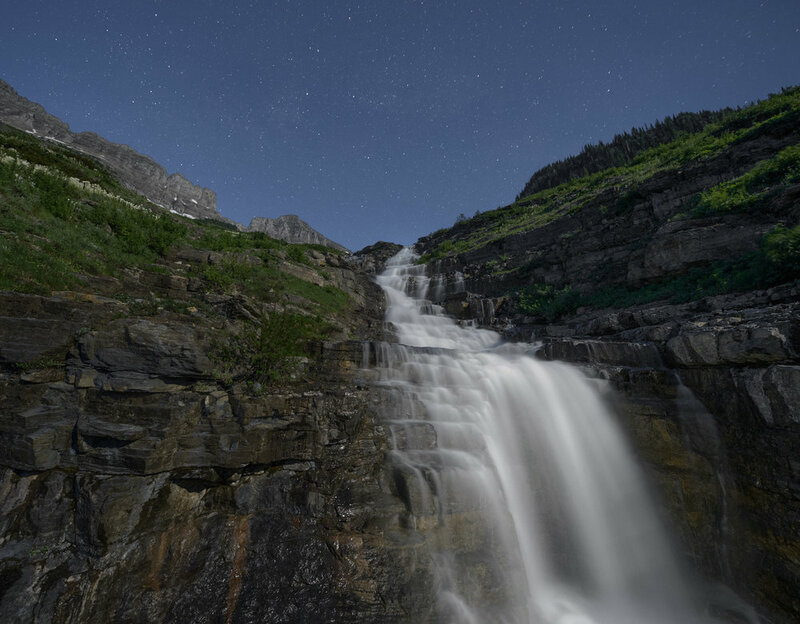 We’ll also venture up in elevation to discover waterfalls and mountain scenes along the lower parts of Going-to-the-Sun Road. 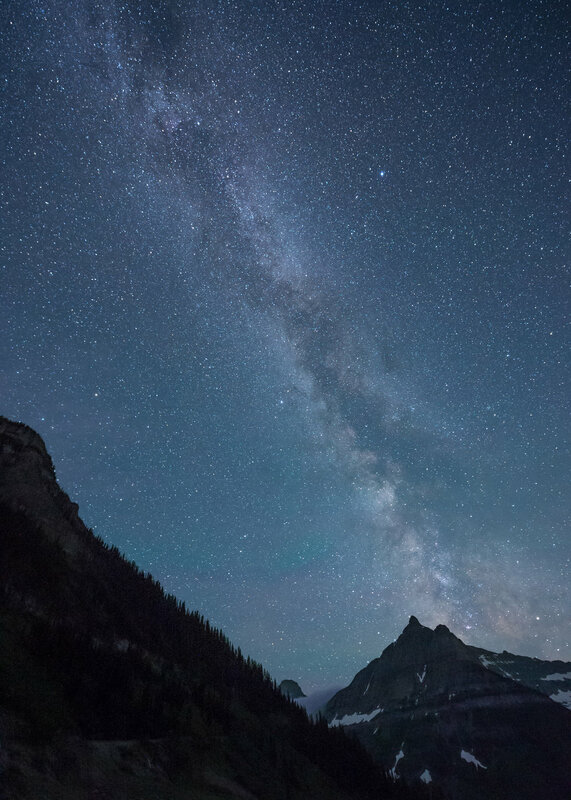 The full moon occurs in the middle of the workshop, providing a variety of different types of night photography, from moonlit landscapes to glimpses of dark skies with the Milky Way floating over rugged peaks. This workshop will have both field and classroom instruction. We will be in the classroom each day, and out in the field at different locations each night. Participants can stay out shooting as long as they, or their camera’s batteries, hold out. While in the field, the instructors will demonstrate their own techniques, and will work with participants one-on-one to make sure everyone gets the most out of the workshop. During classroom sessions, there will be presentations by the instructors, but we will focus on developing your images and sharing everyone’s work and ideas with each other. Each day will have a review of the previous night’s work. To cover the many great locations that Glacier has to offer, we will be basing the workshop at two different hotels during the week. We’ll begin our adventure at the St. Mary Lodge in St. Mary and end at the historic Belton Chalet in West Glacier. You are not required to stay at the official workshop hotels, though doing so does make it easier to meet with the group each morning. Booking info and a group code will be sent after registering. While many shoots will not be very far from the car, there will be some that require some uphill hiking at 7,000 feet of elevation. The trails on these hikes are well maintained, but please consider your physical abilities prior to registering. You should be comfortable carrying your own equipment over uneven ground in the dark. Being the first major national park I ever visited, Glacier holds a special place in my heart. Being only 2.5 hours from Missoula, it’s also the closest park to my home. I love Glacier. It would be impossible to forget my first experience there. Just to set the stage, Going-to-the-Sun Road is probably Glacier’s most famous feature. Winding 50 miles through the park and over the Continental Divide, it’s the only major through road in the park. It tops out at 6,646 feet above sea level when you crest Logans Pass and is one of the most difficult roads in North America to plow. The snow drifts at the top of the pass and along certain stretches of road can reach up to 80 feet deep! We parked at the Avalanche Creek parking lot and waited until about 2 a.m. to begin our ride. I was told that it would take nearly four hours to make the 28-mile uphill ride (with 3,000 feet of elevation gain). They said that would put us that the top of the pass at sunrise. This gave Going-to-the-Sun Road a whole new meaning. We actually were going to the sun. Seeing the park for the first time under the light of a full moon was a unique and moving moment for me. Passing gentle waterfalls along the road, staring up at glowing mountain peaks and looking down into mysteriously dark valleys was truly far more than I had ever imagined. Witnessing the alpenglow on Clements Mountain and the actual sunrise over Going-to-the-Sun Mountain was simply the icing on the cake. After sweating up the road, the cool mountain air on top of the pass was bracing. A quick snack, and down the road we went. The return trip provided a whole new look at the valley and peaks. The early morning sunshine transformed the park into a completely different landscape. My introduction to Glacier National Park was an incredible experience. I am really looking forward to making your introduction (or re-visit) just as memorable!